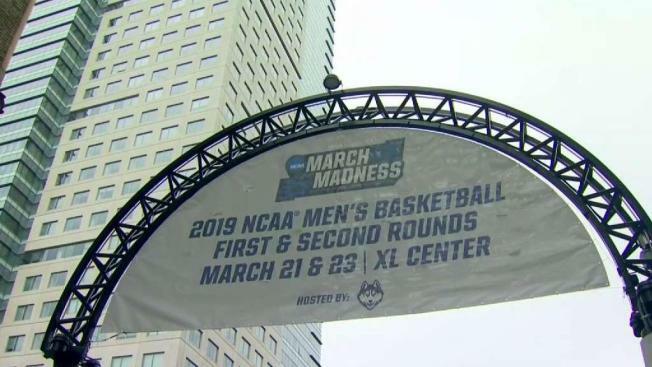 Fans from Vermont, Florida, Indiana and beyond came to the XL Center on Thursday to see the First Round of the NCAA Tournament. A packed Pratt Street was a rarity for downtown Hartford. “I come into Hartford often and walk around and say where is everybody?” Melynda Mudgett said. “We bought the tickets a year ago the package, so we’re here all day today and on Saturday,” Mudgett said. 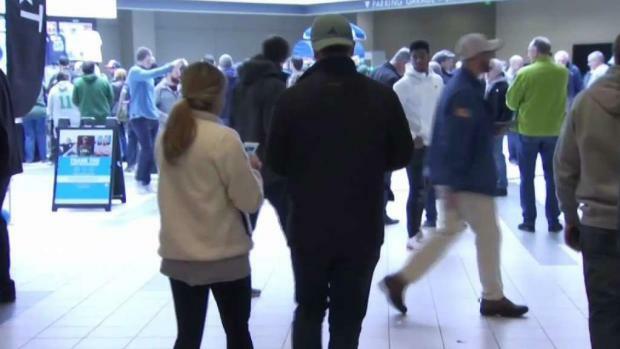 Seeing the hundreds of fans flock to the area even before the first tipoff of the NCAA Men’s Tournament was a surprise for South Windsor native Phyllis Liebman. “You can come here and have lunch or dinner and get a table right away and it was really hard to get reservations for the evening tonight and for Saturday,” Liebman said. “My family is from Connecticut but I’ve never been here,” Mark Stroili said. By lunchtime, Vaughn’s Public House was at maximum capacity. “It’s fun so far a little tough to get a beer but you just got to yell loud enough,” Stroili said. Parking lots downtown that are often never full were packed with cars. “It’s going to be a little tough to find my car,” Stroili said. “This is a city with great restaurants, arts great culture, great sports but also kind of a small town feel,” Hartford Mayor Luke Bronin said. It’s foot traffic Bronin is happy to see but admits will take some work to see it return. “There is absolutely no question if we are ever going to get a tournament like this again, the XL Center has got to be modernized,” Bronin said. Bronin says the investment in improvements to the XL Center needs to be made now. “I think it’s really important we take a moment to recognize just how powerful and vital it is to have a competitive arena that can draw in great teams and draw great entertainment and serve as that gathering point,” Bronin said. The tournament on center stage drawing in plenty of people for the Big Dance. “Let’s hope they keep it up,” Liebman said. Bronin says the tournament is expected to bring in about 45,000 fans and millions of dollars to the area.